Easy to handle because of ultra light weight. Excellent in cold weather. This hose does not harden at low temperatures. 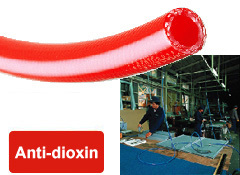 Polyurethane does not produce dioxin. Easy to handle because of light weight. Polyurethane has a high durability.